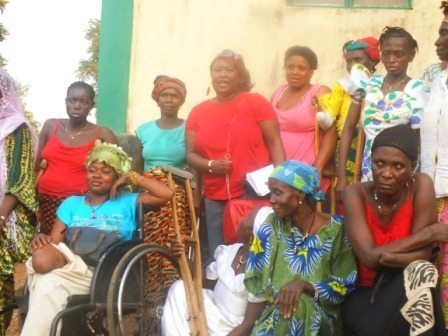 Hundreds of homeliness amputees from across Sierra Leone who were amputated during the 11 years senseless civil war are calling on the Government of Sierra Leone under the leadership of President Julius Maada to help them with land so that they can construct their homes and stop sleeping in the streets. Speaking to the Western Rural District Coordinator for the Amputees, Foday Kargbo said they requested 58 acres of land in 2014 from the past administration of former President Ernest Koroma to not only construct housing facility for the amputees but to also construct vocational institute for them to learn self-reliance skills so that they could be removed from street begging. According to them, the former Minister of Lands, Diana Konomani responded that she can only approve four acres for them but the amputees expressed that the four acres of land which the Minister was about to approve cannot commensurate to serve the high number of amputees across the country in terms of housing and building vocational training centres. In 2017, the former Minister of Lands approved the four (4) acres at Six Miles. Mr. Kargbo explained that the amputees association comprised three hundred and Fifty (350) family heads. The amputee’s association, Mr. Kargbo said, could not make use of the four acres of land for fear of confrontation among themselves because the number of amputees across the country exceeds the available land allocated by the then Minister. They therefore pleaded with the New Direction of President Julius Maada Bio as a visionary man to help them with the 58 land to acres of land to build their homes so that they can avoid sleeping in the street and live comfortable life as citizens.